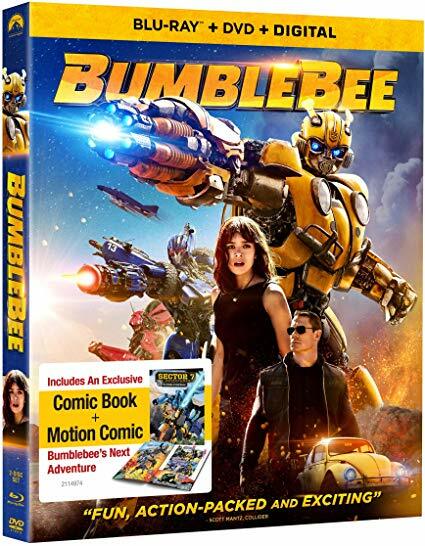 Susan Heim on Parenting: BUMBLEBEE Arrives on Digital, Blu-ray and DVD on April 2! Celebrate with This Blu-ray Giveaway! I like the relationship between bumblebee and the girl. and the robot action as well. The relationship between Bumblebee and Charlie is heartwarming and Bumblebee's origin story and how it turned from a VW Beetle to a Chevy Camaro is explained. I like that it's a VW bug! I really like the action scenes in all of the Transformer movies. They manage to give bumblebee a personality. Ive been a fan since the 80's and i loved the charaters in bumble bee from that time period. seeing that John Cena is in the movie lol. I didn't know he was in it! I grew up with them, so I love them for the fact now my kids love them. Favorite part is the nostalgic it brings for the 80s for me. We are big Transformer fans and Bumblebee has been one of our favorites. The trailer looks amazing and I can't wait to see it! I like that it's a girl with a bug that has a relationship with Bumblebee, usually it's a boy. I loved seeing the Transformers in action! I love transformer movies, they are full of action. I like the part when her car first transforms. My favorite scene is when Charlie & Bumblebee first meet. We love that Transformers can morph into other objects and are super fast. My favorite part of the trailer was when Charlie and Bumblebee first met. It was a very cool scene! I love that there's a female heroine. Transformers movie series always keeps me captivated! Great action, thrills and graphics/animation. Love the fast transformation and bond between bumblebee and her. I like all the action! I love that the movie centers around Bumblebee. 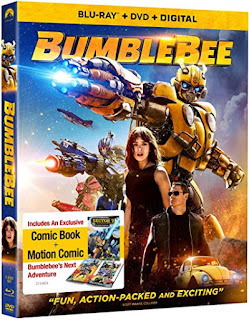 My girls and I all loved the earlier movies and Bumblebee has always been my youngest daughter's favorite (mine, too). My favorite one was the first Transformers movie. My whole family has loved Transformers for so long! Bumblebee is the best. I like that Bumblebee is a VW Bug. I love when she first finds out that he is an autobot. I love the relationship between Charlie and Bumblebee! Love John Cena -- looks like so much fun! My favorite aspect of the Transformers films is all the great action, and awesome visual effects (CGI). I love the visual flash of these movies. Perfect eye-candy. I like that its a VW Bug. I love the visual effects as well as how action packed all of these types of movies are. They are always entertaining and keep my attention all the way through. I love the relationship between bumblebee and the girl. I love that John Cena is in the movie. I love him! Like all the actions scenes. All transformer robot fighting scenes are just amazing, but my favorite part is Bumblebee communicating through the radio. Hilarious! I love transformer movies, they are full of action. I love the action scenes. My kids love watching the transformers. I would love this for them. I'm 38 years old and grew up playing with the original Transformers figures and watching the cartoons. Looking forward to watching BumbleBee. This movie got good reviews! Action-packed! I like when she first finds the Volkswagen. My sons had all the Transformers when they were little and now they all love the movies. I like that Transformers have been around since I was a kid. My favorite part was seeing the inside of an old Beatle. We used to have one. Thanks for the giveaway! The girl and bumblebee. I like the story. I like when he first turns into a transformer. Just watched the trailer with my son and he loved it! He is a fan of anything to do with transformers! I love the connection between Bumblebee and the girl. It reminds me of how he protected Sam within the first few Transformer movies. We love all the action in them. I like that John Cena is in the movie. My favorite part is the background story of Bumblebee! i love all the action! Bumblebee is our favorite Transformer! I love when she finds out what he is! I love all of the action mixed with comedy in these movies! I love how cute Bumblebee is. He just is so adorable. I like the action of the Transformers. I love that Bumblebee is a VW bug instead of Camaro in this movie. I love when Charlie discovers that Bumblebee is not just a car that she fixed up. I love the Transformers movies. All of the stories have a good mix of action and comedy in them. My favorite part of the movie is Hailee Steinfeld's performance. My favorite part is the fact that it is a Volkswagen to begin with. I like the fact that Transformers are more than one thing. Transformers was the first movie that my boyfriend and I saw together in the theater almost 10 years ago!!! I love Bumblebee!!! My littles are huge transformers fans, they like it because of how they transform. I like the nostalgia being an 80's kid. I just like it because my son does!